You want to know what the biggest problem is in today’s culture? It’s not “social justice,” or the fake news media, or censorship, or even the constant indoctrination of the universities. All of these things are manifestations of the same thing. Namely, we live under the rule of a petty, self-serving, and foolish elite class with no accountability, and who would gladly destroy their own country in the name of making a buck or for the vain promotion of how virtuous they are. Worse? Many of them don’t even know this. They actually believe in something akin to their divine right to rule, where they can’t be wrong, and can’t be held accountable because they’re good and you’re not. Witness the self-imposed chaos by in Britain over Brexit to get a hint of this. Closer to home, the “results” are in and they confirm what we’ve known all along – “muh Russia” is a hoax set up by the servants of the status quo to mitigate and ultimately rescind the results of an election they lost. Now even their Divine Deliverer, Robert Mueller, who was supposed to be the deus ex machina in this plot, has failed. I’ve held off on commenting on this for a week just to see what sort of reactions we’d get. I haven’t been surprised by any of them. In the most hilarious example of it yet, they manifested their belief in their divine right to not be wrong by continuing to peddle the “collusion” hoax, grasping for whatever straws they could find. They’ll circle back to duds that have already been out for a long time, or desperately cling to “does not exonerate him” on obstruction (ignoring that if there was obstruction, Mueller would have prosecuted), or froth that Bill Barr is lying about the report, even though that would assume Mueller and goons like Andrew Weissman would let such lies slide. Undoubtedly, they’ll get egg on their face again when the full report is released. Then they’ll move on to the next part of the hoax. Why will they move on? Because these people have no accountability. They have pumped fear and hysteria into the minds of millions of people for years and think they won’t be held accountable for it. Unlike in most sectors of life, there’s no penalty for being wrong when it comes to the political, media, and academic bubble these people reside in. The peddlers of a much more destructive hoax, the Iraq War (many of whom have gone on to peddle this hoax) got off with no repercussions, after all. If we are to create a theme for 2019 let’s make it about this – it’s time to hold the bubble accountable. The Covington kids’ suit of fake news outlets like CNN and Jeff Bezos’ Blog (the Washington Post) is a good start. The fake news media as a whole resembles more and more an unregistered political action committee for the DNC. Lawsuits should be brought against them on that basis, because with the Yashar Ali story and the way the talking heads immediately marched to Nancy Pelosi’s orders on healthcare this week, we definitely know there’s coordination. Meanwhile, those who spread the muh Russia hoax need to be held accountable, legally whenever possible, but if not, through a relentless campaign of public shaming for the damage they have done to the country. We’ve already gotten that started with Trump’s latest linguistic kill shot. 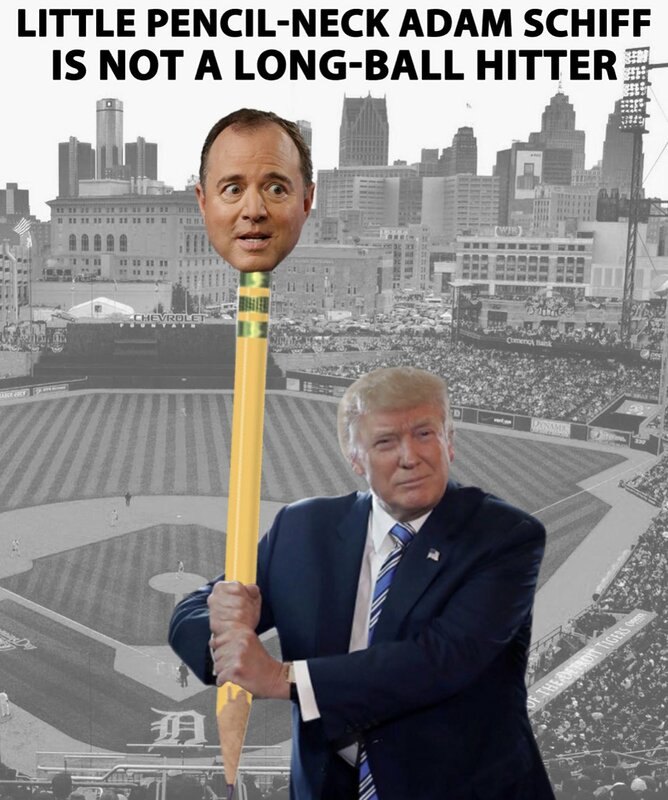 Little pencil neck Adam Schiff must be pilloried all day, every day. They’re vulnerable. They’ve now lost the battle and hilariously, they don’t know it, making them even more vulnerable. Let’s use a Russian analogy just to make humiliating them more fun. It’s the Battle of Kursk. The Germans think they have an opportunity to launch an offensive, but the Russians got advanced warning because the British cracked the German Enigma codes. It was all a trap for a massive Russian counter-offensive. Their continued peddling is fine for the people that live in the mass hysteria bubble, but for those outside of it, the more they do this, the worse it makes them look. That offers even more opportunity for a massive counter-offensive. To crush them worse, read Stumped and immerse yourself in the persuasive techniques that saw them defeated the first time. Trump’s “DACA Deal:” 4D Chess or Gross Betrayal?